These days we’ve been used to China being the land of “the first,” “the largest” and “the highest.” However, not all of these superlatives are worthy of praise. China now has the largest diabetic population in the world (114 million), according to a recent study published by the Journal of the American Medical Association (JAMA). The high diabetes prevalence in China reflects a combination of genetic and environmental influences. Other things being equal, Asians are more likely than Caucasians to develop diabetes even at a body weight considered “normal” by mainstream western standards. Also, more than half of the Chinese live in cities (as opposed to 20 percent in 1980); 9 percent of the population are aged over 65 (as opposed to 5 percent in 1982). In addition, Chinese are leading increasingly sedentary lives while turning to increased high-calorie, high-fat, and high-sodium diets. 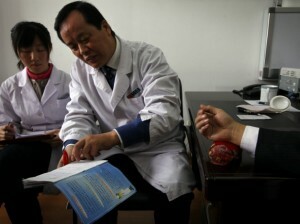 According to a nationwide Disease Surveillance Points (DSPs) survey carried out by China CDC, the per capita sodium intake is 10.6 g/day (compared to <2g/day recommended by the WHO), and among the population aged over 18, only 12 percent exercise on a regularly basis, 32 percent are overweight, and 12 percent are obese. But lack of effective state intervention is equally to blame. According to the NEJM research, 60 percent of Chinese diabetes patients are not aware of their conditions because, despite the nearly universal health coverage in China, screening and outpatient services for diabetes are not yet a covered medical benefit in many parts of China. As a result, a large number of patients do not seek care until they have developed symptoms or worse, are in the late stages of diabetes. As the JAMA study shows, only 26 percent of diabetes patients in China were treated for this condition, and among those treated, only 40 percent had adequate glycemic control. It is therefore imperative for the government to construct a diabetes prevention and control system that raises awareness of the disease, promotes healthier life styles, enables early identification of the disease and risk factors, and encourages timely and effective treatment and interventions.